APCOM’s Headlight Series aims to increase access to important global and regional policies, strategic information and other high-level publications, including legal and policy analyses, research reports, and skills-building tools by summarising information into short briefs using simple language. In partnership with Youth Voices Count, this Headlight summarised the Consolidated Guidelines on HIV Prevention, Diagnosis, Treatment and Care for Key Populations, which was published by the World Health Organization (WHO) in July 2014, with a particular focus on the issues of concern among the MSM, transgender and youth population. 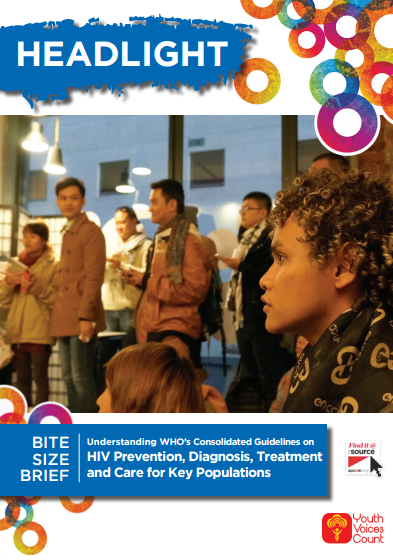 This bite-size knowledge product is designed for use by community HIV and sexual health organisations and advocates working with key populations particularly MSM and transgender people. APCOM closely coordinated with the WHO in developing this brief. 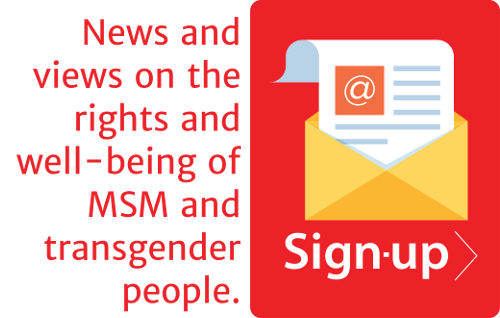 WHO assisted in reviewing the document to ensure key information, relevant to MSM and transgender, were not missed. A survey was also widely distributed to gather responses from the community about the Guidelines. “The involvement of the MSM, transgender and young population at the core is necessary for the wide and effective dissemination of the Guidelines,” said Executive Director Midnight Poonkasetwattana. The result of the survey, along with the Headlight, was then presented at a satellite session co-convened by APCOM and WHO in AIDS 2014 Conference, Australia, that aimed to further integrate the Guidelines within community work.